May 28, 2012, Washington, DC: It’s on these hot summer nights that arrive unseasonably early in Washington that we romanticize Vieux Montreal. We let our minds travel back down the narrow streets and alleyways in the oldest part of the city and we recall -- sweating -- what it was like to feel cold there. Downing lemonade with extra ice, we remember fondly our dinner by a fireplace on Rue Saint-Paul back in December when the cobblestones were slick from an icy rain turning to snow. We remember feeling oh-so-Parisian during that lunch of butternut squash soup and red wine at the luxurious Hotel Nelligan, and we consider how quickly time passes -- that it feels like just yesterday we ducked into Bon Secours Market for hot chocolate and now we're darting into DC's museums desperate for a blast of cold air. In this heat, we envision again what it might be like to live there and we conclude with certainty that, absolutely, we would. In our overheated daydream, we imagine reporting to work after a holiday weekend at one of Old Montreal's creative ad agencies or a smart little marketing firm. We see ourselves spending the day at a large desk in a large old window in front of a large new computer. We imagine stopping by to watch the ice skaters at the Old Port on the way home from the office. We picture returning home to an old neighborhood loft as night falls, wood-beamed ceilings just above, restaurants full of soft light just below. On these humid summer nights in Washington, we think of Christmas there. We remember how beautiful those angels and blue lights looked donning Notre Dame Cathedral late at night. 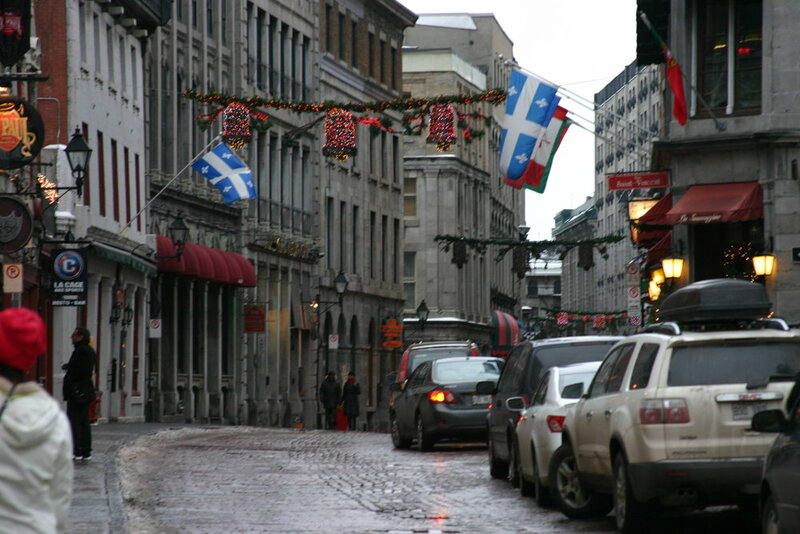 Has summer arrived yet up there in Old Montreal? With a singular vision in mind of the neighborhood in winter, it seems impossible that it could be full of warmth now, and flowers, and outdoor cafes. In my imagination, it will always be a perfect night for French onion soup far off in Vieux Montreal.